Labor of Love: Work done for the sake of one's own enjoyment or of benefit to others rather than for material rewards. After countless hours of planning, designing, painting and tweaking, the day to reveal Fireman Cam was finally here! On Friday, Oma and Jane drove over to Meadow Brook Elementary in the afternoon for the costume parade. Chris met us there with the Halloween creation. 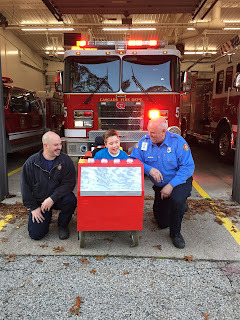 Wearing a fire truck shirt, the engine was placed over Cam's powerchair and the handmade controls for sirens and lights were right at the firefighter's fingertips. As he drove into school, his classmates stopped to asked questions and see how everything worked. The kids paraded around the entire gym where parents gathered to see all of the elementary students dressed up. Afterwards, the festivities continued in each classroom for fall festival parties which included making crafts and eating fruit and treats. Then it was time to take Cam over to his dad's office for some indoor trick-or-treating. The pumpkin shown is one Chris carved using a dremel tool (in his spare time!) to show where all of the company offices are located. By this time, Fireman Cam was an expert navigator making his way through the office maze of desks and workers. 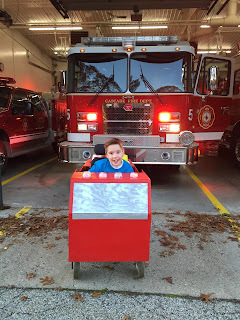 Numerous people commented that they were certain real fire trucks were parked outside the building with their sirens on....but, then they saw Cam appear around the corner! Michelle met us at the office and even wore her own fireman's shirt! Cam let her borrow a Jr. Fire Chief hat to wear. 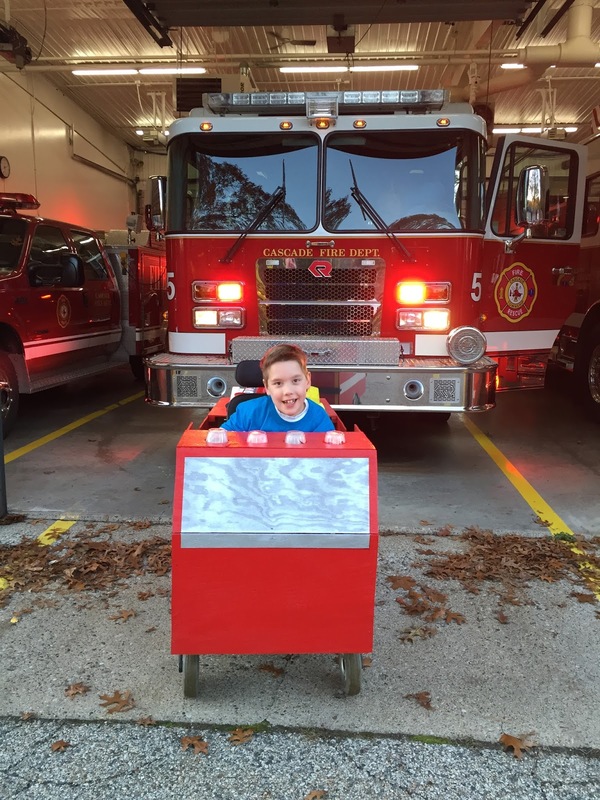 and headed over to the Cascade Fire Station where they host a party for kids on Halloween eve. Each child receives a silver bag of candy (top pic above) complete with toothbrushes, toothpaste and floss- very cool! Chris and Jane weren't sure if Cam would want to drive through the neighborhood after being out in the cold rain. But, our trooper persevered and was adamant about trick-or-treating on his own street! With an umbrella affixed to the back, he and his dad visited every house with a porch light on, which happened to be a total of 4. Jane was very surprised when the doorbell rang and there was her last trick-or-treater of the night...Fireman Cam himself! Since the weather didn't cooperate on Halloween, the Weatherford family decided to visit the Cascade Fire Station once again on Sunday late afternoon. Chris found his way inside and two of the fireman not only came outside, but also posed for pictures with Cam. They even turned on the cool lights on the huge fire truck in their garage. While talking with the firefighters, we learned that over 700 kids came through the station on Halloween. All of the items are donated and we were certain they must have run out. They actually had close to 100 bags left. We are reminded again of the awesome community we live in and those who give so much of themselves for others. Many of said Chris and Cam really outdid themselves this year... In reality, they outdo themselves on a daily basis! How did she make your day? She said "I love you, Cam." We all have a job! You stay here and pass out candy to anyone who comes here. You look for houses with me that have porch lights on.